Sparkle and Spin’s dedication reads, “ To all children that like ice cream,” accompanied by a brown triangle topped with a pink semicircle. Such is the brilliance of this book originally published in 1957 and recently re-released in 2007 (Chronicle Books). 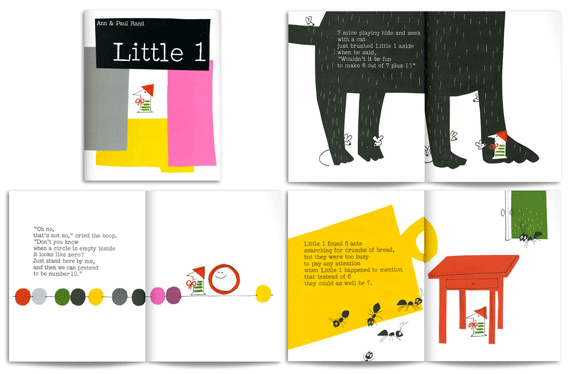 It is written by Ann Rand and illustrated by design icon Paul Rand—best known for his corporate work such as the IBM logo and original UPS logo. 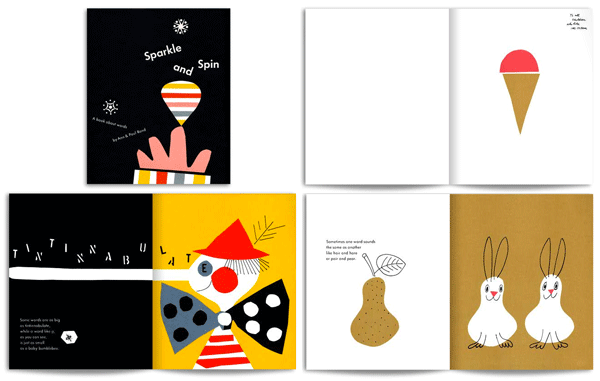 The illustrations are extraordinarily playful—almost as if cut from paper by a child—and are paired with rhythmic words that are just as playful to read aloud. Originally published in 1962, Little One is another example of Rand’s visual wit. This is a story of a lonely number 1 in search of being something more than a single digit. Page after page of rejection from bigger numbers, he eventually finds himself standing next to a zero—together making 10! The story goes that Rand designed these books in one sitting each, not unlike the genius of a child! If you didn’t know, you would think that Paul developed a unique ‘childlike’ style that he employed in his kid’s book designs. The truth is that Paul Rand—the master of corporate identity and design as we know it today—employed the same touch that he used in his day job as a designer for corporations like IBM, UPS, Westinghouse and Olivetti. Just goes to show that wit and simplicity are universal and know no age. Thanks for introducing me to this book!